The Original Crypt The choir of York has, under the platform of the high altar, a small Norman crypt, which occupies only the middle aisle in breadth and one compartment and a half in length. The vault is supported by six Norman pillars, and the ribs of the vault are Norman but the side piers or responds are evidently Perpendicular, and the transverse arches of the ribs are four-centred. These characters seemed to shew that this crypt, if part of the Norman church, must at least have been altered or tampered with during the rebuilding, and this was all that could be conjectured until the unhappy fire that originated with the insane Martin in 1829. The works consequent on the repairs that followed this miserable event led to the discovery that the pillars and lower parts of the walls of another crypt extended under the whole of the western part of the choir and its side aisles. Also that the crypt above mentioned, which had been so long, known, was in fact a mere piece of patchwork, made up during the fitting up of the choir in the fourteenth century, out of the old materials, to support a platform for the altar, and provide chapels and altar room beneath it. The Norman Nave As for the western portions, or nave and central tower, the north-western angle of the north-western pier still retains the Norman ashlaringr in the parts above the vault of the side aisles, and also a portion of the shaft, with its base, that appears to have belonged to the Norman clerestory of the nave, all which proves that the tower pier in question stands upon the same site at the Norman one. 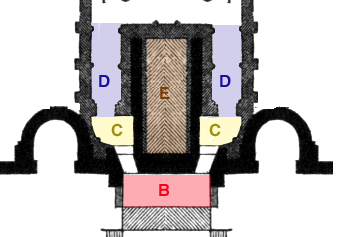 Similar remains, but not so strongly marked, are to be found on the southern side, so that on the whole, and making proper allowances for the different arrangements of the two styles, it results that the centre of the Norman nave was only one foot narrower than the present one.s The second fire, in 1840, by placing the nave under repair, enables a search to be made for the foundation of the side aisle walls of the original, of which remains were found that determined their width,t and from all these researches I have derived that Norman Nave and tower as laid down in my plans. But it is necessary to observe that there are not data for the position of the west end of this nave, or for then number of piers in the nave, which two particulars I have inserted in my plans for the Norman church (no. 1 and No 2.) merely "pour fixer les idees". The Norman Transept Next for the Norman transepts. Amongst the remains of the crypt, I was fortunate enough to detect a sufficient portion of the exterior wall of a Norman apse in the north-west corner of the crypt to determine its existence, position, and very nearly its magnitude, as laid down (at A in No. I and No. 2 [above]). 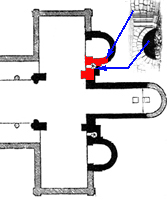 As there is no instance of a transept which has a western aisle when the eastern aisle is wanting, and as by the connexion of this apse with the tower pier it is clear that no eastern aisle was here., it may be assumed that neither was there a western aisle. 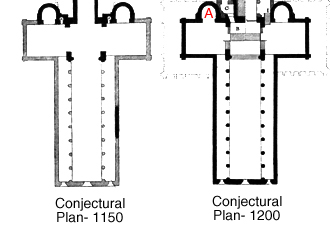 The length of the transepts is mere matter of conjecture. And it is possible that another apse may have been introduced in each transept between the one above mentioned and the gable"u . The Norman Crypt Having now explained the western parts of the edifice, I will proceed to the eastern, which are more complicated and difficult to understand....[Click here for floorplan] In this crypt may now be seen the remains of a vestibule (C), leading from the church to the side aisle (D) of the crypt ; for as at Canterbury, Gloucester, Worchester, Winchester, &c., it appears that this crypt was entered by its side aisles. The door from the vestibule to the crypt was a beautiful and rich piece of Norman sculpture. The passage westward from the vestibule to the church is now filled up and obliterated, but its commencement may be traced, and it could only, as it appears to me, have been arranged as in the plans, which I will presently explain at length. Upon entering the side aisle (D) of the crypt through the Norman door of the vestibule (C), (of which only the bases and part of one jamb remains,) we find a side-aisle wall to the north, with four windows and compartments, after which is a protecting building (G), a kind of eastern transept, but which, from the greater thickness of its walls, was evidently a tower, flanking, as was commonly the case, the eastern part of the choir. Beyond this, access is now stopped, and the whole of the eastern part is in fact so occupied by graves that I became impossible even to explore it, much less to leave it open like the rest. However, during the repairs enough of the side wall was traced to determine its extent, as shewn in the plans, and also to shew that it returned at right angles at the east end, and that there were no traces of an apse at this part in the centrex . At the western end of the crypt, a portion, shewn on the plan (at E), was included within strong walls, and filled up solid with earth; but the eastern end was a vaulted apartment, and had stout Norman pillars at the sides, under the piers of the work above, while in the centre the vault, as usual in crypts, was sustained by two rows of single smaller pillars. The larger pillars were of elaborate design, decorated with diaper work, and had four small shafts placed around each. Moreover the vaults were ribbed, instead of being merely groined, these characters all indicating an advanced style, and shewing that the work in question belonged to the age of Archbishop Roger, who, as we have seen, (in chap. i.,) is distinctly recorded as having made the choir and its crypts. As to the arrangement of the eastern portion beyond the towers (G G) above mentioned, there is no certain evidence, except the fact just mentioned that the eastern end was square. But from the form of the east wall and its uniform thickness, as far as it could be traced, it is most probable that an aisle (H) passed across the end, and behind the eastern gabley . This is the arrangement of the square-ended choir of Romsey, in Hampshire, and of Byland ; and this will serve to account for the increased width of the last compartments as shewn in Mr. Browne's plan; for as this eastern aisle would of course be made the receptacle of altars, an increased space would there be required. All these portions of the crypt belong to the same style, but the walls of the vestibule (C) were evidently constructed after the rest of the crypt, and there are appearances which shew a little change of plan. These are to be found in the manner in which the base of a vaulting shaft, that is placed against the jamb shafts of the entrance door, is intruded upon, rather than united to, the bases of the latter.z But as the contrivances of the vestibule and entrances to the crypt would very naturally be left to the last, a slight change of plan of this kind is not sufficient evidence of a chance of the architect or period, and I must consider the whole as the work of Roger, and the more so because the same base-moldings that occur in this vestibule are also employed in an arcade on the north side of the cathedral close, which appertained to the palace that Roger is recorded to have built, and probably therefore was a part of his work. The interior walls of the solid part E of the crypt, exhibit remains of earlier structures that are exceedingly interesting. [See the detail to the left of the floorplan} Each side wall is in fact a triple wall, of the entire thickness of between ten and eleven feet. On the outside is the wall of Roger's crypt, [bright magenta] 3 ft. 6 in. in thickness; in the middle is a wall apparently of great antiquity, 4 ft. 8 in. thick [aqua] ; and on the inner side, the third wall, which lines the latter, and is only two feet thick [bright yellow]a . The middle wall [aqua] is faced with herringbone work, and of coarse workmanship, and has evidently belonged to one of the early structures, possibly to the Saxon church. As to the walls which case it, the outer one is plainly a part of Roger's crypt, and was erected against the middle one in order to provide for the foundation of his piers above, which rested partly upon the old wall and partly upon the new one, the width of his choir being too great to admit of his employing the old wall alone as a foundation for them. The inner thin wall is partly constructed of old materials apparently derived from some part of the church that was pulled down to make way for the new crypts. These exhibit moldings of early Norman character, and they consist of the coarse sandstone of which the apse (A) already mentioned was built, and pieces of a chamfered basement like that of the same apse are also worked into these walls. Some of these stones have served for the interior of a building, for they are covered with fine white plaster, having the joints of masonry marked upon itb. This apse was uncovered by the removal of the lining masonry at the north-west corner of the north vestibule, (C,) for the purpose of examining the state of the foundation of the tower pier, and it is still left in its uncovered state. The following sketch will shew how distinctly it is indicatedc . Church The next question is, how these remains are to be interpreted with reference to the history of the edifices that preceded Roger's crypt, for the style of that crypt, as I conceive, fully justifies me in assuming that it is the crypt which the historian Stubbs ascribes to Archbishop Roger. It has appeared from the first chapter of this history, that King Edwin began a church in 633 which his successor finished; that Archbishop Wilfrid thoroughly repaired and glazed this church in 699d ; and that the first Norman archbishop, Thomas, first repaired the Saxon church, and afterwards built a Norman church. The nave, the transepts and their apses, and the central tower, I have already explained; their arrangement is precisely similar to that of most early Norman cathedrals, and there can be no doubt that they constituted parts of the church of Thomas. For the remaining part of that church, namely its chancel, there may be two possible suppositions. 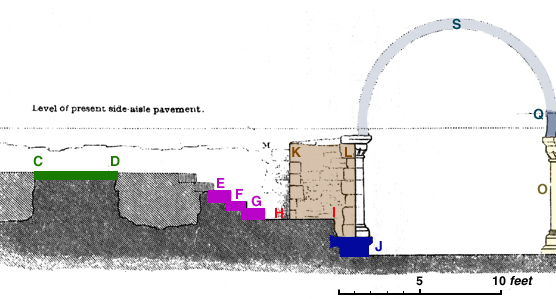 It appears pretty certain that the ancient walls in the crypt are a part of the Saxon church, for they enclose so narrow a chancel that they could scarcely have been erected by Archbishop Thomas for his new church, and indeed the materials and mode of construction are different from the apse and arch that certainly did belong to that church. The first supposition then, is, that having already repaired the Saxon church, this archbishop retained it, or at least its eastern part, and began his new church by the erection of the transepts, tower, and nave, already described, and that he was unable to complete his plan by rebuilding a chancel of suitable magnitude. In this case the Saxon chancel remained till Roger commenced his operations. The second supposition is, that the Archbishop Thomas pulled down the Saxon church, and left the lower part of its walls as we now see them, and that he erected a chancel of befitting magnitude, which, falling in the way of Roger's crypt and choir, was entirely pulled down so as to leave no trace at all. And this hypothesis is partly sanctioned by the remains of masonry, apparently of Thomas' work, which have been already mentioned as worked up into the inner lining so as to shew that some building of the age of Thomas was pulled down when that lining was set upe . This inner lining appears to me to have been introduced to serve as a foundation for the timber-work of the seats of the monks in the choir above, for the central part exhibits no trace of having been vaulted, and as it is closed to the east by a wall of Roger's period, it seems that it was filled with earth in his church. The history of Canterbury at this period throws some light upon that of York which is worth examining. Lanfranc, the first Norman archbishop of Canterbury, built that cathedral on the plan and dimensions of St. Stephen's at Caen, the abbacy of which he had quitted to become archbishop; and accordingly he furnished that cathedral with a short choir like that of its prototypef . Archbishop Anselm took down this short choir, and replaced it by one extending magnificently eastward, and provided with a crypt, an apsidal aisle, a procession path with radiating chapels and flanking towers, as well as with eastern transepts, all of which features it wanted before. Since the publication of that history subsequent researches have led me to conclude that this extended plan was an imitation of that of the great abbey of Cluny. Now Roger, before he was made archbishop of York, held the office of archdeacon of Canterbury from 1148. The glorious choir of Conrad, as the work of Anselm was called from the name of the prior who finished it, had been completed more than twenty years, and was the pride of Canterbury. What wonder, therefore, that Roger in his new see should imitate this work, by substituting for the short and simple chancel of York minster a complex eastern building, which, making due allowance for its want of equal dimensions with Canterbury choir, is yet evidently planned upon the same system of extending and enlarging the eastern parts of churches. But being squaire-ended and of less extent, instead of the apsidal chapels of its prototype, there. are only altar-places in the eastern aisle, and the flanking towers are made to perform the part also of eastern transepts. If the apse in fig. I [above] be examined, it will be found that there is in connexion with it, on the south side, an arch of solid workmanship, and of a span of rather more than five feet. This arch appears to have carried a turret for a staircase, the remains of which Norman staircase may still be seen in the triforium of the choir at its western extremity, but the rest of the staircase and turret have long been destroyed. Its place is shewn ...[in the diagram at right]. A spiral staircase, in the same position, occurs at Norwich, and its use is to conduct to the upper galleries of the church, and also to the upper chapels of the apses ; for these transeptal apses had commonly a chapel on the triforium level as well as belowg . But this arch shews that no wall of a chancel could have joined the church at less than five or six feet south from the springing of the apse; and indeed, from the little room which it leaves, proves that there was no side aisle to the chancel. Whether Archbishop Thomas did really erect a chancel, or whether the remains and fragments of his work that are found in the lining walls belonged to such a chancel, or only to the repairs and alterations which he had made in the Saxon church, must always remain a matter of doubt; and I prefer to leave the question in this state, as far as I am concerned, rather than to attempt to argue from such insufficient data; however, it appears to me very probable that he did only repair the Saxon chancel, and leave it to be rebuilt after his nave and transepts were completed. The floor of the crypt is seven feet five inches below that of the present south side aisle of the choir, which is the general level of the nave and transepts. But the old pavement of the nave, according to Mr. Browne (p. 110), was four feet lower than at present, therefore the floor of Roger's crypt was only three feet and a half lower than the Norman nave, and his choir was twelve feet higher. At Canterbury the present heights are four feet and twelve feet respectively. So far therefore the arrangement of the respective levels of the nave, crypt, and choir was the same in the two cases; and we may confidently employ the Canterbury example as a guide in investigating the whole arrangement of the steps. The crypt was terminated to the west by a strong wall, which connected the two eastern tower piers, and which was more than fifteen feet high. In this wall, close to each tower pier, the archways must have been pierced that led to the vestibules C, and a passage B under the upper landing of the choir would provide a convenient access to these archways, and at the same time a passage from one transept to the other as at Canterbury. The six or eight steps necessary for the descent into the crypt were probably thus distributed. Two, as far as I remember, still descend from the vestibule C to the side aisle D. Possibly three or four more were placed in the archways, and one or two between the transepts and the passage B. The arrangement of the landing place under the tower, and of the steps that led down from it to the nave and transepts, I have assumed to have been the same as at Canterbury, and as such have introduced them into plans No. 2 and 3i . There is one curious remain in the space E that was filled with earth between the triple walls, that I have still to explain. In the course of clearing out the earth the workmen came to a slab of stone, about five feet higher than the level of the pavement of the crypt, which they left undisturbed, but cleared away all the earth round it, so that it now stands up and resembles an altar. Also a little to the east of this slab they found three steps, the remains of a staircase, which formerly descended from west to east. These were also preserved, and from their present appearance are commonly supposed to be the steps that led to this altar. [This section] shews the relative position and arrangement of these steps. K, L, is the section of the wall that separates the crypt from the western part once filled with earth. The black parts of the sections shew the stones that remain in situ. C, D, is the slab; E, F, G, the three steps, and there is just difference enough between the levels of the top step E and the slab, to shew that two more once completed the stair, as shewn in the higher tint. At the bottom of this stair is hard concrete and rubble from H to I, and also the foundation of the crosswall, of which J is the bench-table. The stair evidently descended from above to a crypt, but whether it belonged to the churches of Thomas or of Roger is not so certain. The hard surface H, I appears to forbid the conjecture that this stair ever conducted to the crypt of Roger, neither is it likely that it would have opened abruptly upon the bench table J This bench-table is quite perfect along this crosswall, although the wall itself is so ruined as not to shew whether there was a door in it leading to this staircase. But in the earlier churches, both Saxon and Norman , the crypts were much smaller than in the later ones, and were confined to the extreme east end of the church under the high altar. That of the Saxon church of Canterbury was entered in the middle by a stair similar to this. I conjecture, therefore, that this was the stair which led to the small crypt or "confessio" of the Saxon chancel.